Website will be updated – most likely – after 17. 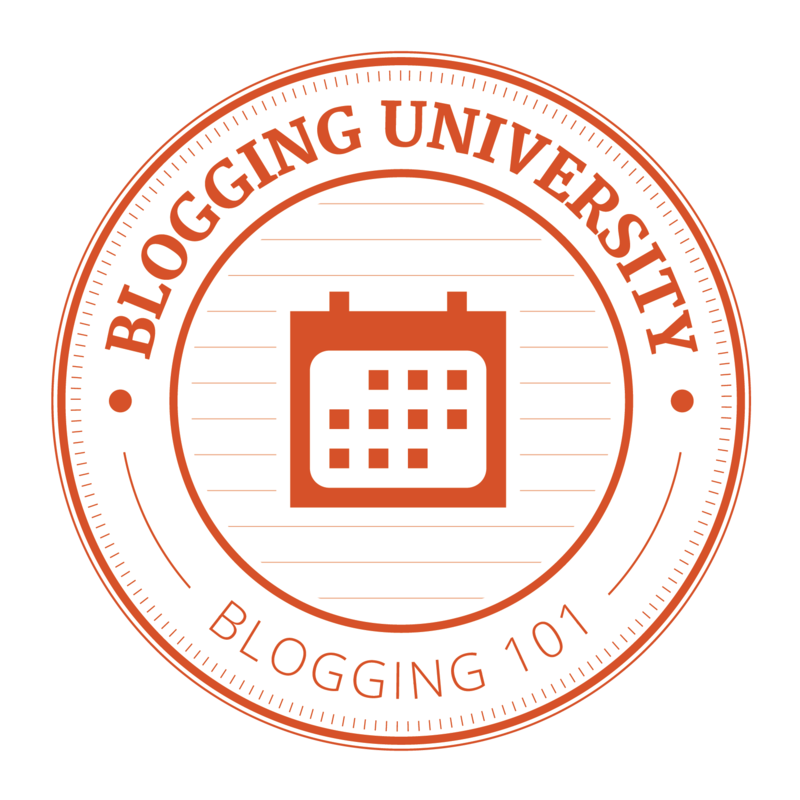 July 2015! Sivuston seuraava päivitys todennäköisesti 17.7.2015 jälkeen! The Global Peace Index (GPI) is implemented by organization called Vision of Humanity, which groups together a number of interrelated initiatives focused on global peace. As its mission Visions of Humanity brings a strategic approach to raising the world’s attention and awareness around the importance of peacefulness to humanity’s survival in the 21st century. Now on May Vision of Humanity published its new edition of the Global Peace Index (GPI). It has been expanded to rank 162 independent states and updated with the latest-available figures and information for 2013-14. To the table below I have collected the GPI rankings from the Balkans and Eastwards on countries analysed in 2015 report. In addition I have included to table also top-3 and worst-3 countries, the BRIC countries and USA. Besides 2015 ranking I show also rankings and score in 2010 [when available] to see trend during last years as this may help to track when and how some countries become more or less peaceful. Countries most at peace are ranked first. My source – Vision of Humanity Org, GPI results, full list of 149 countries, methodology and other explanations and scores per country/indicator can be found from here! 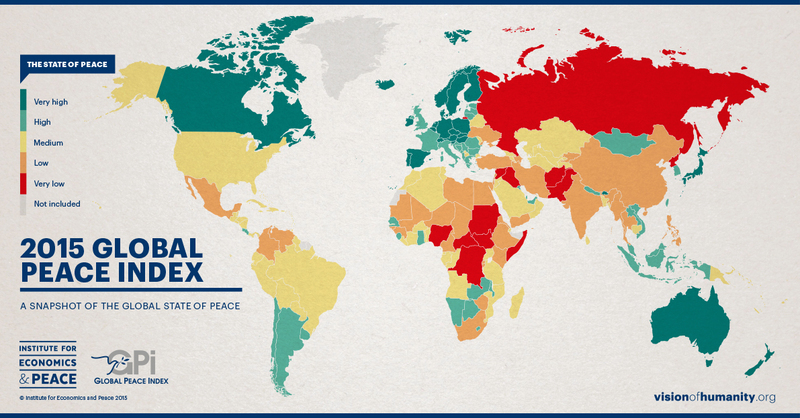 Besides my table one can also explore the data on the interactive Global Peace Index map. Also Balkans has bacome more peaceful as all countries of this region made better ranks between positions Slovenia – 15 to Macedonia (FYROM) -71. All ranks of BIRC countries as well USA went down. In general the world is less peaceful today than it was in 2008. The indicators that have deteriorated the most are the number of refugees and IDPs, the number of deaths from internal conflict and the impact of terrorism. Last year alone it is estimated that 20,000 people were killed in terrorist attacks up from an average of 2,000 a year only 10 years ago. Due to an increase in civil unrest and terrorist activity, the Middle East and North Africa is now the world’s least peaceful region for the first time since the Index began. The best in Mideast ranks was Jordan -71 following Saudi Arabia -95, Egypt -137, Iran -138, Lebanon -145, Israel -150 and on the bottom Iraq -161 and Syria -162. The country that suffered the most severe deterioration in peace was Libya, which now ranks 149th of 162 countries. Ukraine suffered the second largest deterioration, from 97 to 150: following a revolution which brought down the administration of Viktor Yanukovych, Russia supported regions of East Ukraine agains Kiev regime, meaning it scored poorly on organised conflict indicators. 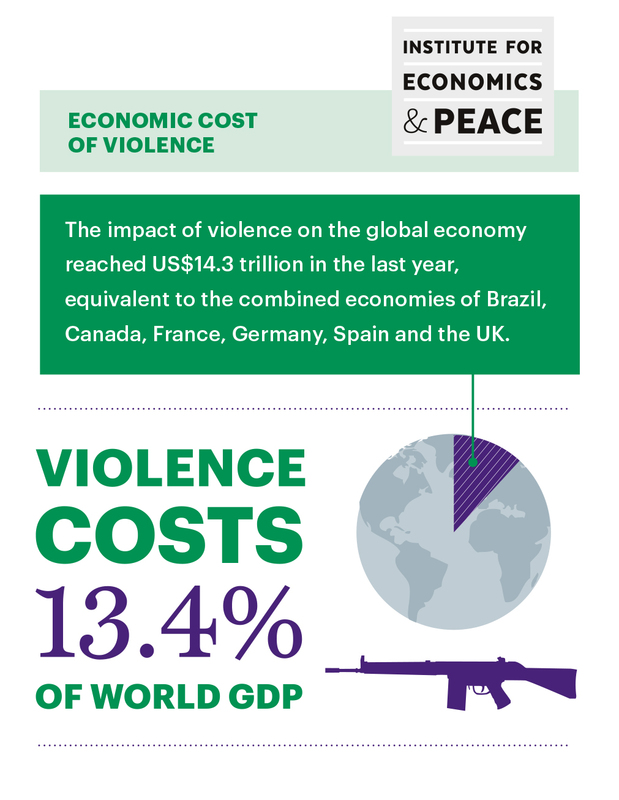 Related to the economic impact of violence one esily can see that peace has also its monetary value in terms of business growth and economic development. 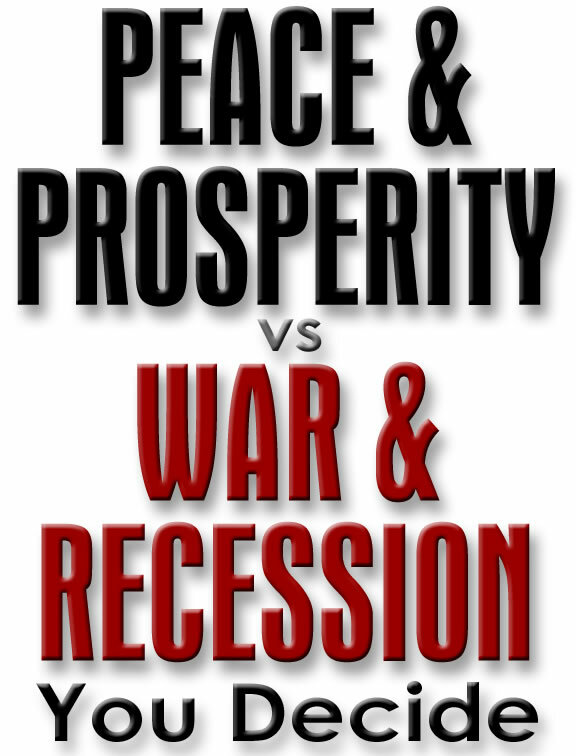 However also war has its monetary value and in short term business – especially inside military-industrial-complex – world the profits from war can be more attracting than those from peace. In my previous articles “Arms Trade: The Crux Of The MIC“, “BTW MIC Still Rules“ and “Peacemaking – How about solving Conflicts too?”. Two States is a fraud! Russia cancelled its South Stream gas pipeline project in December 2014 replacing it with new Turkish Stream pipeline. The follow-up of this Russian-Turkish project is re-routing the energy supply in whole Eastern Europe with Greek and Tesla [Balkan] Stream gas pipelines. The head of Russian gas producer Gazprom stated on 7th May 2015 that the firm had decided to start building the Turkish Stream pipeline and that preparations to build the undersea stretch of the pipeline were under way. During a meeting between Gazprom’s Alexei Miller and Turkish Minister of Energy Taner Yildiz, the parties sent a resounding message to gas markets: the Turkish Stream will be brought on stream in 19 months. Natural Gas Europe reports: “We had very efficient and crucial talks today. It was agreed to bring onstream Turkish Stream and to start gas supplies in December 2016. Gazprom, while implementing its portion of work under the Turkish Stream project, will follow the agreements reached today,” Miller said in a note released on 7th May 2015. “Gazprom has moved to the construction stage of the sea part of the Turkish Stream pipeline,” Gazprom chief executive Alexei Miller said in an interview with a Russian television. The Russian firm may be reviving the infrastructure that it built for the South Stream. South Stream gas pipeline construction in shallow waters will begin in first 10 days of June 2015. The pipes originally bought for South Stream will be used for the Turkish Stream. For laying the pipes in the bottom of Black Sea, Russia rented two pipe-laying vessels from Italian Saipem company in last fall. Following the cancellation of the South Stream pipeline project in late 2014, Gazprom has paid €25 million monthly to Saipem without any usage of the vessels – Castoro Sei and Saipem 7000. Recently there has been some tensions between Russia and Turkey. Russia’s President Putin participated to the ceremony in Yerevan to commemorate the Armenian victims of the 1915 events, and Turkish leaders have made some critical comments over situation of tatars in Crimea. However now it seems that the Turkish and Russian delegations have renewed their commitment to increase energy ties. (More e.g in NaturalGasEurope ) . There are three main sources of supply of pipeline gas to Europe. They are Russia, Norway and North Africa. Norway probably will keep or even reduce the volumes. Besides, North Africa provides gas only to Italy and Spain and its volumes have significantly reduced in recent years. During last years LNG (liquid natural gas) has came more to European gas markets. There is now more LNG gas terminals in Europe and some new terminals will came in 2015 e.g in Poland and Lithuania so in principle it is possible to import LNG from US. However Europe has decreased its LNG imports due its high price; and as Asian LNG import prices as well demand are much more higher than those in Europe it seems that LNG is not real alternative to Russian gas. LNG suppliers have redirected the volumes of liquefied natural gas to other premium markets and Europe can only be guided by those surpluses when they are not in demand in Asia. The construction of the Trans Anatolian Pipeline, which will connect the South Caucasus Pipeline to the Turkish-Greek border is already initiated and the construction of the Trans Adriatic Pipeline, bringing gas to the Italian market, will follow. These investments will secure some 10 billion cubic metres of gas a year from Azerbaijan by 2019 to the European market. The Russian gas to Europe has now three main energy high ways: 1st The Nord Stream via Baltic Sea, 2nd Jamal, four pipelines through Belarus and 3rd Transgas or pipelines through Ukraine. More than 86 billion cubic meters (bcm) of the gas exported to Europe by Gazprom passed through Ukraine’s pipeline network in 2013 – about half of the total. There is also some economic reason to re-route Russian gas via Turkish Stream instead of Ukraine as modernising Ukraine’s gas transport system is estimated to cost 19.5 billion dollars. Turkish Stream will redesign completely the energy supply route in Turkey and Eastern Europe. Gas that is currently transported via the Trans-Balkan Pipeline through Ukraine to Romania, Bulgaria and Turkey will be re-routed so that Turkey will become the first and not the last recipient of gas in the supply chain. One new aspect are gas interconnectors between Central and East European countries. These interconnectors allow a much better crisis supply of gas, together with new reverse-flow capacities. Gazprom has already told Europe that it plans to cease using its current export route through Ukraine in 2019 and shift those natural gas supplies to the Turkish Stream pipeline. As Russia now begins construction on the first of Turkish Stream’s four parallel pipelines, each with a capacity of about 16 billion cubic meters. Gazprom can use this first pipeline to supply Turkish natural gas market. Three other pipelines can be implemented when EU and especially Central and East European countries decide to build infrastructure to deliver gas from Turkey to European markets currently transported by the Trans-Balkan pipeline (TBP) to Turkey via Ukraine, Moldova, Romania and Bulgaria. The expiration of a transit agreement on Russian gas supply through Ukraine in 2019 along with the completion of Turkish Stream mean that TBP will likely be suspended. This in itself would be beneficial to Turkey as its security of supply would no longer be vulnerable to Russia’s political stand-offs with Ukraine or other eastern European countries along the route. 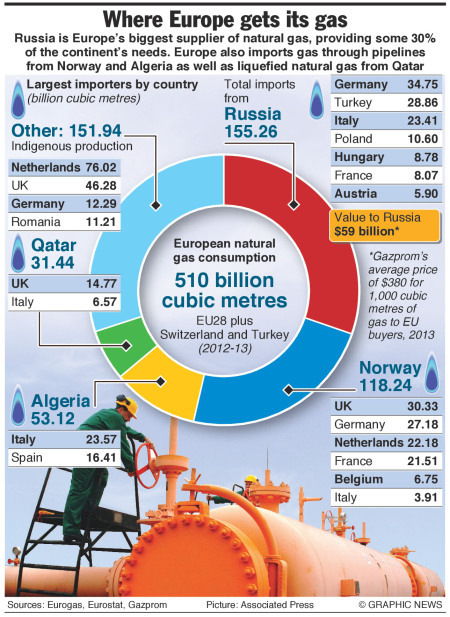 On 7th April 2015 representatives of five countries – Hungary, Serbia, Macedonia, Greece and Turkey – met in Budapest, announcing the formation of a working group to facilitate natural gas deliveries – specifically infrastructure development – to their markets from gas emanating from Turkey including possible participation in the Turkish Stream pipeline. The group has pledged to meet again in July and hopes to involve Albania and Bosnia & Herzegovina. As for whether Gazprom can finance its three major pipeline projects the company has a strong balance sheet, relatively low level of net debt and robust cash flow. Considering it has spent $20 billion on transport over the last few years, the spending required on Turk Stream, Power of Siberia and Altai averages about $10 billion/year. One of the main factors in Moscow’s shift from South Stream to Turkish Stream was the EU’s Third Energy Package (TEP). Under these rules, a single company cannot own the pipeline through which it also supplies gas. Neither Russia nor Turkey is an EU member, and so neither are bound by the TEP, which makes the construction of Turkish Stream much easier. However, the construction of Turkish Stream is not the only issue at stake. The pipeline will have to stop at the Turkey- Greece border because of the TEP rules, given that Greece is an EU member state. 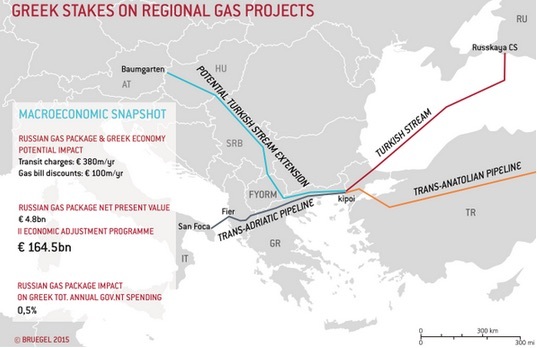 In order to transport its gas to Greece and onwards, Gazprom needs to use existing interconnectors – either TAP or Interconnector-Turkey-Greece-Italy, including the DESFA-operated Greek National Gas Transmission System (NGTS). Turkish Stream will traverse the Greek territory as ‘Greek Stream’ and then it will spread itself into two routes. Turkish Stream will traverse the Greek territory as ‘Greek Stream’ and then it will spread itself into two routes. 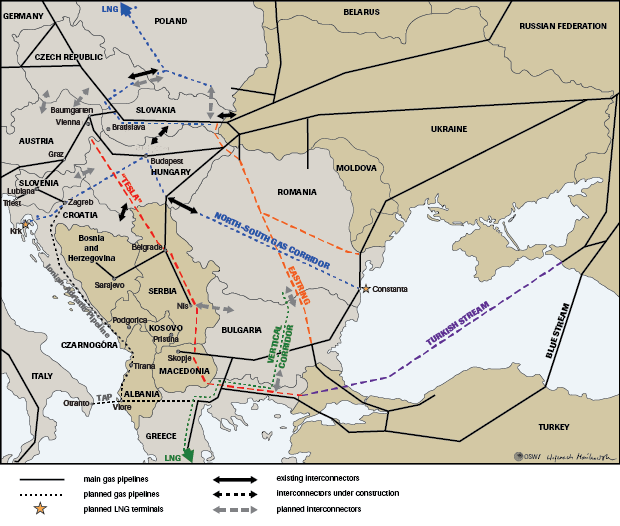 A main line towards the North via FYROM and Serbia and one towards Italy, merging itself with the Italy-Greece Interconnector (ITGI) which originally was to transfer Azeri sourced gas from Western Greece to Southern Italy via the Adriatic Sea. It is of interest to note that ITGI is already eligible under the EU’s Projects of Common Interest (PCI) and it is already owned by 50% by the Italian Company Edison which is a subsidiary of the French EDF. Trans Adriatic Pipeline and the Turkish Stream pipeline will not be competitive, as each of them will have an own role to play. TAP cannot satisfy the huge demands in natural gas of the European states and peoples and that the project would not be an alternative to the Turkish Stream. The Greek extension of a pipeline to pump Russian natural gas through Turkey to consumers in southern Europe could cost about 2 billion euros and its construction will create about 20 000 working places. An agreement on the construction of the Greek extension of a proposed pipeline to pump Russian natural gas through Turkey to consumers in southern Europe could be signed at the St. Petersburg Economic Forum on 18-20 June 2015. Turkish Stream is replacing the previous South Stream project which Moscow ditched due to EU (and Bulgarian) resistance to unblock construction. The “Tesla Stream” is an offshoot of “Turkish Stream”. The concept is to connect ‘Turkish Stream’, the Russian pipeline to Turkey’s Eastern Thrace region, to a new hub on the Turkish-Greek border. Tesla pipeline would move gas further across the territory of Greece to the former Yugoslavian Republic of Macedonia (FYROM), Serbia, Hungary, reaching the Baumgarten gas hub in Vienna, Austria. 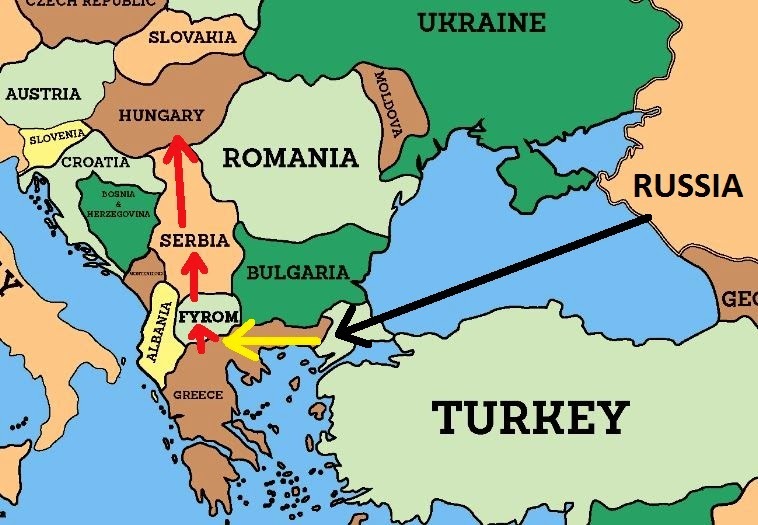 So compared to South Stream Turkish and Tesla Streams are detouring through Greece and Macedonia to compensate for the exclusion of Bulgaria. The foreign ministers of Greece, Macedonia, Serbia and Hungary met 7th Apr. 2015 in Budapest to explore their potential participation in Russian plans for the new Turkish Stream pipeline. In the joint declaration on strengthening cooperation in the energy sphere which was signed at the end of the meeting, the parties “expressed their support for the idea of creating commercially viable routes and sources by supplying natural gas from Turkey to countries in Central and South-Eastern Europe via the territory of the member countries”. It was also emphasised that the pipeline would be fully covered by EU regulations. After this positive response Russia’s President Putin and Greek Prime Minister Alexis Tsipras have discussed the construction of the so-called Greek Stream pipeline across Greek territory. ‘Russia confirmed its readiness to consider the issue of funding the public and private Greek companies that would be involved in the project’ reads a note published on the Kremlin’s website, referring to the gas transportation system on the Greek territory. Russia, Turkey and the West all share one rival in the Balkans: political instability. Located at the confluence of three historic empires, the strip of land between the Mediterranean and the Black Sea has long been the focus of competition among global powers. Now it is just one arena in the standoff between Russia and the West. The United States and the European Union have been involved in the internal politics of the Balkans since NATO committed troops in the aftermath of the Bosnian war and the conflict in Kosovo in the 1990s. Recently with the help of the local revolutionaries and ethnic terrorists, the West was trying to destabilize Macedonia (FYROM) in order to overthrow the democratically elected government and to withdraw the country from the Tesla Stream. 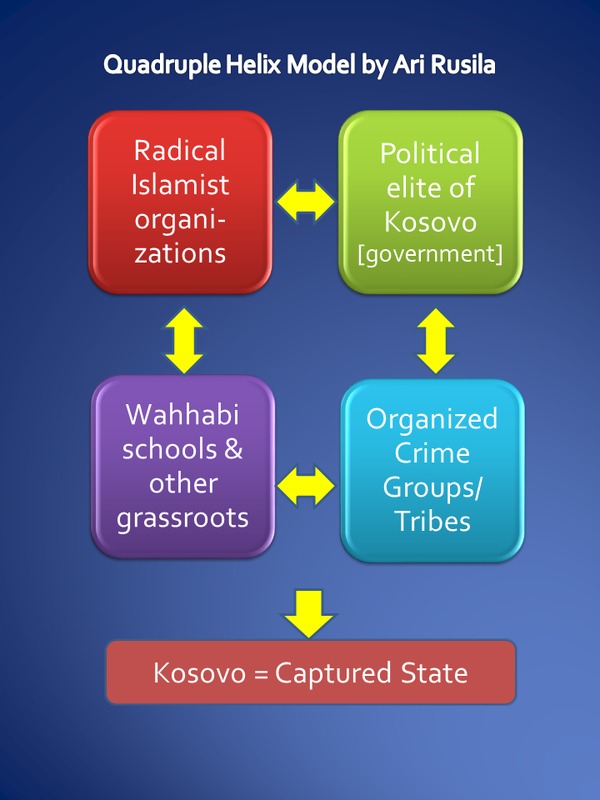 (More background in my article Terrorism in Macedonia Wasn’t An Isolated Act! and Oil Geopolitics: The South Stream Pipeline Has Been Replaced by “The Balkan Stream” by Andrew Korybko). Also US has already contacted Greece and expressed the negative stance of Washington regarding the Turkish Stream in general. The bottom line from my perspective is that Turkish Stream will deliver 14 billion cubic metres per year to the Turkish market and there is a good change that another 49 billion cubic metres Russian gas per year will flow to Europe – partly for fulfilling the contracts already signed – via a new hub on the Turkish-Greek border and through Greece and Tesla Streams. In my opinion it is also noteworthy that Turkish Stream and the creation of a gas hub on the Greek Turkish border, coupled with the planned TAP and TANAP pipelines, give Greece and Turkey more reason to enhance cooperation on energy matters as all these lines are generating remarkable transfer fees for both countries. Similarly also from its side Tesla Stream will create significant transfer fees for Macedonia (FYROM), Serbia, Hungary and Austria in addition to their energy security. Related article: Is South Stream Pipeline Transforming Itself To “Turk Stream”? 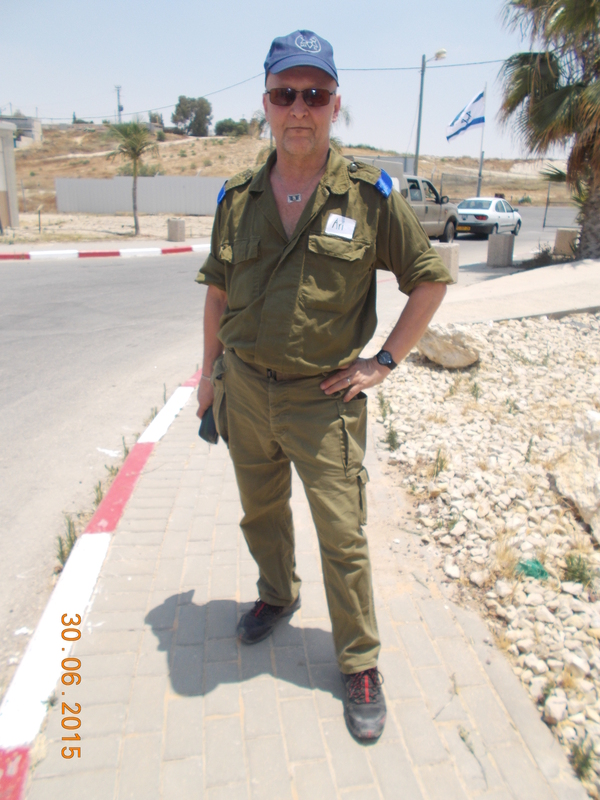 You are currently browsing the Conflicts by Ari Rusila blog archives for June, 2015.